Learn ways of funding a micro business with our report How to Fund a Micro Business. An international Micro Business offers the ultimate freedom. Earn income anywhere in the world. See below an excerpt from my report How to Fund a Micro Business. Gain ideas on how to get funds to start your own international micro business. The perfect international micro business can lead to the perfect international business tax loophole. Discover tax protection from international business that won’t end. Find out why below in this excerpt from my report “How to Fund a Micro Business”. The salmon sunset faded in a plum wine horizon and fell drunken in its beauty behind a razor backed ridge. Bird songs grew faint in the evening dusk. Stars awakened, diamond beacons studded in an inky night. Rosaspamba, Ecuador. Merri and I cuddled in a growing darkness, fireplace warmed against the evening mist that shrouded our hacienda deep in the Andes. “Life is good,” we thought. We are among the luckiest people in the world. We feel a communion with our God. Our children are fully grown, healthy, well educated, independent and leading balanced lives of purpose. We have one another, the excitement of our own goals and challenges. Plus we can live, financially independent, anywhere in the world we choose! The goal of this report is to share this great fortune with you. Granted this providence has come in part through hard work, dedication, frugality, persistence, sacrifice, perseverance and more. These are qualities business people must develop if they want success. Then we also need great luck. This has come to Merri and me through the incredible backdrop of our lives. We, as baby boomers, were given a set of conditions that no other people in recorded history have been able to even dare dream, much less enjoy. As boomers we entered the world of business just as technology shrank the globe. T.V., telephone and low cost travel in jet airplanes provided a horizon-expanding global backdrop to our economic activities. Not even royalty of past times had or could imagine this. Technology enhanced our lives with the fax, the computer and internet. These new inventions unhinged boundaries and expanded perspectives so we could enjoy lifestyles that had been unthinkable just a few short years before. Technology means that Merri and I can be at our rain forest Ecuadorian hacienda far from any civilization and still run a business with tens of thousands of readers all over the world. The first of these innovations made it possible for me to begin a global business in 1968 at the age of 21. I started selling investments for a brand new mutual fund company. They had given me a pretty large territory, Asia! I had worked from Hong Kong and traveled continually touching down briefly at the firm’s U.S. headquarters in San Francisco every couple of months. My bi-monthly commute went like this; San Francisco to Tokyo to Seoul, South Korea then Taiwan before I stopped and stayed a while at our regional headquarters in Hong Kong. Then I headed south to Saigon, Bangkok, Kuala Lumpur, Singapore, Djakarta, Manila and back to the U.S. I was a young man who had never been out of Oregon so these journeys changed my perspective incredibly! This business gave me a lot of experience at financing micro business start ups in creative ways. I have quite a bit of experience in micro business lending. As mentioned my job when I was just 21 years old was selling US mutual funds in Hong Kong abroad… starting in 1968. The 1960s had seen great economic expansion in the US until the stock market collapse of 1968 and the recession in the early 1970s. The chart below from tradingeconomics.com clearly shows this. This killed the US mutual fund industry in the US and my business along with it. After six years of this Asian experience, the company I worked for went broke and I was stranded in Hong Kong. The knowledge I had gained allowed me to sell my way out of the mess before immigrating to London, where I lived and worked in England and Europe for over a decade. I had to start a new micro business. I shifted to selling US and Fiji real estate plus raising money for small US businesses. Plus I found micro business funding for my own business. London was the financial center of the world at that time. I had to live there to stay in tune with global investment markets. Then the fax became a household word. Freedoms expanded. So I was able to add a home in the subtropics of Florida. Then as communications improved, we were able to stop commuting between London and Florida and shift our living so we could enjoy Florida ’s warmth in the winter and North Carolina’s cool mountains in the summer. The computer and internet made this possible. Finally by adding cell phones, DSL, satellite communication and the Internet; Merri can now run our global business with over 30,000 readers spread around the globe from our isolated farm in the Blue Ridge or our inn high in the Andes of Ecuador or our Florida home. Here are delegates learning about how to develop an international micro business at our farm house in North Carolina… just about as as remote as you can get on the East coast of the USA. We have the ultimate freedom of earning income wherever we go and have earned millions by simply traveling, discovering and sharing what we learn in our travels. 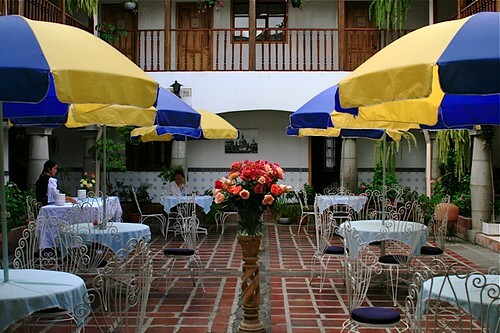 Here is the courtyard of our Ecuador hotel (where we conducted many seminars). This report shares ways I gained micro business funding and helped others do the same. This can help you enjoy the freedom of this lifestyle gain income, security and independence. Knowing how to fund a micro business can help you have a business anywhere in the world. This means that anywhere you go, whenever you travel, wherever you live, you have a business. Trips turn into tax deductible, profit generating events rather than after-tax dollar expenses. You gain mobility, freedom, unbounded horizons and the ability to pick up and go wherever you desire without worrying about how you will financially survive. Let me give you an example of a micro business selling tax liens. Here is a case study of one micro business idea whihc is to sell a US tax lien service globally. Tax lien certificates are issued by county governments in the United States. Counties generate most of their revenues from property tax. This is a growing business as more and more property owners fail to pay their property taxes. If property owners don’t pay their tax, this can create a revenue short fall. The way many counties deal with this problem is to let outside investors pay delinquent taxes on behalf of those who do not pay. When outside investors pay the tax, they receive a tax lien certificate that guarantees that the investor will be repaid with substantial interest…when the property owners finally pay their tax. The full value of the property guarantees the return to the investor. Since property taxes normally only range from 1% to 2% of a property’s assessed value, the real estate can be worth 50 to 100 times the investment made. There are three things that make these certificates attractive investments. First, tax lien certificates are quite safe. The guarantee normally supersedes most other types of liens, including mortgages, IRS liens, etc. Simply said, the property cannot be sold until that tax and penalty is paid back to the investor. In addition if the property owner does not pay the tax within a specified period of time (this alters from state to state), then the investor who holds the certificate has the right to become owner of the land. The other safety factor is that the investor pays his money to the government and gets paid back by the county government. The county takes care of the entire administration of the collection and payment to the investor. You can safely say that the investors pay their money to the government and get paid back by the government. In some rare instances, if a property owner does not eventually pay the tax, investors are given ownership of the land. This is not a bonus that comes along everyday, but when they do occur they can create substantial profits. There are instances of investors obtaining houses worth $40,000-$60,000, even $70,000 for investments as little as $6,000. Tax Liens are not as safe as it used to be with falling US property prices… but usually the tax owned is small percentage of the value of the property. Second, tax liens offer high returns. The interest charged delinquent tax payers varies from state to state, but some states charge as much as 25% interest, which in some instances can be earned in a day! This is really important in times when returns on most fixed investments are really low. Third, tax liens are complicated, require work, effort and take time. Laws, rates and systems vary from county to county. Investors should look at every property before investing in the lien. Plus someone normally has to attend county sponsored auctions to invest in these liens. To invest wisely in tax liens, an investor needs to know the property market in the area where he or she invests. It is important to know the rules, regulations and procedures in that county and finally it is important to stay in tune with the market, inspect properties, attend auctions and often take over and sell properties that might revert back. All this effort means that most investors do not invest in tax liens. They choose easier, less attractive, riskier investments such as stocks and bonds. This complication means that your competition will be limited. This also means that tax liens are almost perfect investments to market to overseas investors. First and foremost investors from a distance want security (which is why they are investing in the U.S. in the first place.) They pay their money to the government, have the security of the real estate and they get their money back from the government. Second, overseas investors want extra profit and you can easily show them how even after paying your service fee, they can make much higher returns with greater safety than in stocks and bonds. Finally, the whole process is so complicated that they cannot do it without you! The cost of their travel to the U.S., regular inspections and management of the process would cost much more than your fee. My report “How to Fund a Micro Business” walks you through all the legal asset protection and tax benefits that an overseas micro business brings. The most effective structure from a tax deferral point of view is a non U.S. structure (corporation, LLC, limited partnership or trust) that operates entirely outside the U.S. and that is owned 50% or more by a non U.S. person. If I were building this structure today, I would look for non U.S. citizens or residents to work as sales people and help me expand sales. They would own half the company. I would look to them for capital and business growth. Some business owners do not want to have someone else own half their business. If this is the case, I recommend that you donate half the business to some U.S. charities. Pay them some dividends as your profit and treat them well. The more charities you select (the Circle of 100 gives one half percent of the business to 100 charities) the less likelihood that any will ever interfere with your control of the business. This gives you practical (though not complete) control. The second point on security laws is important because many countries have a myriad of regulations relating to securities. You must be careful that you do not violate security or investment laws in the countries where you do business. To overcome this, if I were doing this business today, I would not seek investors in the countries where I go. I would sell information. I would instead offer reports, education, real estate inspection and auction services. I would sell correspondence courses and seminars on tax liens. I would never offer investing advice, consultation or services. Three steps are needed to get investors to use your services. #1: you need to reach the customer. #2: you need to create confidence in the product. #3: Finally you need to create confidence in your services. This is good because these three needs create the three business opportunities above of #1: offering tax lien courses or reports, #2: selling tax lien seminars and #3: providing a tax lien service. This generates three steams of income, making it easier to reach customers by mail or over the internet (through correspondence courses), providing an early education before you meet physically. Seminars and reports also add authority to you and your services. My business would first help investors learn about tax liens. Then it would help them learn about liens being auctioned. Then it would inspect property for the investor and represent them at auctions. These services are not likely to violate security regulations anywhere (though you should always check). Then I would offer the correspondence course and seminar customer base my property inspection and auction services. I would act as the investor’s agent to bid at auctions on behalf of the investor. Investors would never give investments to me or my firm. They would always pay their investments direct to the U.S. county governments. They would also always be repaid directly from the U.S. county governments. My fees for the property and auction services would be a percentage of profits that customers gained from these real estate and auction services. I would organize assignments on the liens that investors purchased through me so when the investor was paid by the county, I would automatically be paid my share of the profit from the county as well. Though you should always check laws in each country where you do business, it will be rare that selling courses and seminars and acting as a person’s property and auction agent (without receiving the investment yourself) will run afoul of regulations. Because form is of vital importance in regulations, if you plan to do substantial business in any one country, check with an attorney and make sure that your documentation is correct for that country. If one desires even additional layers of legal protection from legislation, an added step is to conduct seminars and talks outside the country where customers live. For example, if you were going to offer services to German investors, conduct all your courses in Switzerland and do not allow Swiss investors to participate. This method of business not only helps reduce risks of regulatory problems, but also makes good merchandising sense. By focusing first on selling reports about tax liens you establish a base of customers who are likely to be interested in coming to tax lien seminars. The seminar delegates become the logical customers of the property inspection auction service. Tax liens are complicated. Every state, every county has a different set of rules. This is good as well. If the business were really easy, everyone would do it! There are two questions that first need to be answered. #1: Where in the US will you develop your tax lien expertise. #2: Where will you find your clients? Choice number two can help you zero in on the answer to questions #1. If you want to develop business in Asia then a service on the US . If Latin America is your choice then perhaps Texas. European clients are probably going to be most interested in property on the U.S. East coast. There are a number of factors to consider to decide where you want to find your clients. First, decide whether your reason for being international is more location based or profit oriented. If, for example, a main reason you want an international business is that you like to spend lots of time in Paris, France is an obvious place to market your products and services. On the other hand, if you’ll travel wherever business is good, broad based marketing in global or regional publications may make more sense. Then focus on the areas from where you get the best response. That’s the idea. You can apply the principles of this study to any business idea and then use the business evolutionary cycle. Step #1: Get a micro business idea that leads to enthusiasm. Step #2: Let the enthusiasm lead to an education. Step #3: Let the education lead to action. Step #4: The action will create profits or loss and experience. Step #5: The experience leads to new micro business ideas. This is the way successful businesses grow… starting small and evolving philosophically, financially and structurally as they expand. Each time the cycle repeats you are more experienced and more capable of making better and larger decisions. I hope you have enjoyed this excerpt from my report “How to Fund a Micro Business”. You can order the entire report here.